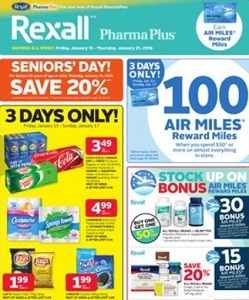 Featured offers in this Rexall flyer: $4.99 ea. Cashmere Bathroom Tissue Double 12-Roll Or spongetowels Choose-A-Size Paper Towels 6-Roll; $1.99 ea. Lay’s Potato Chips; $2.99 ea. Arm & Hammer Laundry Detergent 1.84l-2.21l or Savvy Home Paper Towels 8-roll; $1.77 ea. Lady Speed Stick 24 Hour Invisible 45g Or Speed Stick 70g Or softsoap Liquid Hand Soap 225ml; $6.99 ea. Nyx Cosmetics; $13.99 pkg. Always Discreet Incontinence Underwear Or Pads 15’s-66’s Large Packs Or Tena Underwear Super Plus 12’s-18’s, Pads 30’s-72’s, Guards 48’s Or Protective Underwear 12’s-14’s; $6.99 ea. Folgers Ground Coffee 920g Or K-cups 12’s; $2.99 ea. Rexall Brand Shave Gel or Foam; $3.99 ea. Rexall Brand Body Wash; $2.99 ea Nature Valley Or Quaker Granola Bars 130G-230G Or Kellogg’s Nutri·Grain 175G-295G; $2.49 ea. Pringles Potato Chips 151g-182g, Popcorners 142g Or Popchips 85g; $8.99 ea. Energizer Max Batteries; $2.99 ea. Nivea Body Wash 500ml Or Anti-perspirant or Deodorant 43g Or 50ml; and more. Find amazing prices in the latest Rexall flyer for your local store.